I am not up to writing… and it’s been a while since I have. My brain works fine, well, in theory, but I’ve had a rough week or two health wise. 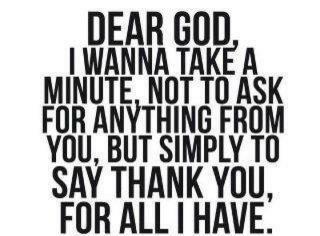 Never the less, I have been thanking God for the many blessings I’ve been given over the last year. It’s amazing how many answers to prayer have come about in just one circular year. When I have bad weeks, my brain gets messy. It’s unclear what I really think and I miss so much of the reality. This time, however, instead of being a wallowing mess, and thinking myself alone in it all, I am gonna remember that I am FAR from alone, and be grateful for the many things that have gone RIGHT, not just the things it’s easy to remember that haven’t. And when I say “haven’t” gone right – what that really boils down to is “not my way”. Hmmm…. that sounds a bit like a child being ungrateful. So instead of blogging tonight… I am going to go count my many blessings. Yes this is a blog – but you get my point! I read somewhere that people who write down in a notebook three great things that happened to them every day are happier. I would add that they should thank God for those blessings too.